Do you crave the best roast beef and long for the days where you can get your mouth around the fluffiest and crispest Yorkshire puddings? Here are the five of the best Sunday roast lunches in London you have got to try. 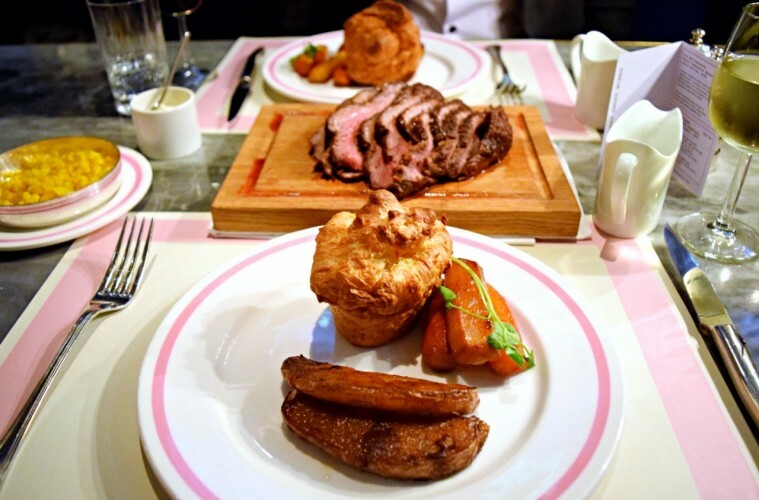 The best Sunday lunch in London by quite some way is the Sunday Roast at Bob Bob Ricard. If you are looking to spoil yourselves with not only the food but great service, a Bob Bob Ricard Sunday lunch is for you. The roast menu is simple, 16oz of USDA Prime Black Angus Beef. You are treated to a roast rump of corn-fed Arkansas beef which is cooked medium and is served with all the best sides, including slow roast potatoes, carrots, parsnips and our Editor’s favourite large Yorkshires. 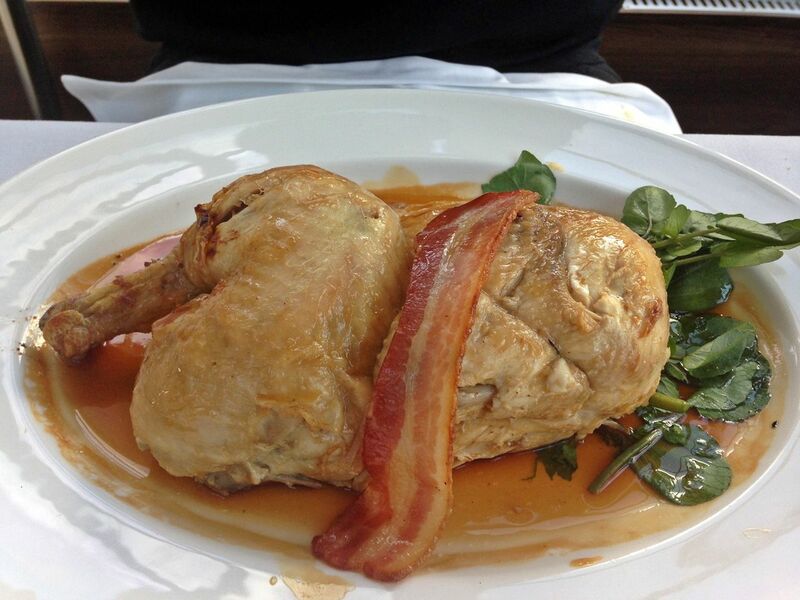 At £29.50 per person it is at the higher end of the Sunday Roast market, but you it is most definitely worth the money. Don’t forget to press the champagne button if you really want to treat yourself. Booking in advance is heavily advised. Pharmacy 2 is a restaurant concept from Damien Hirst and Mark Hix, located in the Newport Street Gallery. 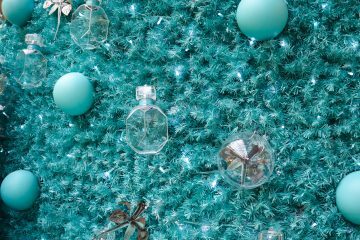 As soon as you enter you will be hit by the striking pharmacy style interior design. As you might expect from a Mark Hix restaurant you have some great food and cocktail options. The beef is served as thick and medium, so if you like a hybrid between a good Sunday Roast and a good steak this roast is for you. You are given large bowls of vegetables and offered a full range of desserts. Two courses start from £23.95 and if you are hungry enough go for the cheese and crackers dessert. 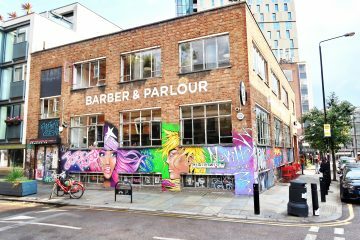 Borough Market is known for its great food stalls, street food and it’s very British Roast restaurant. Roast celebrates roast dinners everyday with the best local produce and offers a number of different daily and weekend roast options. 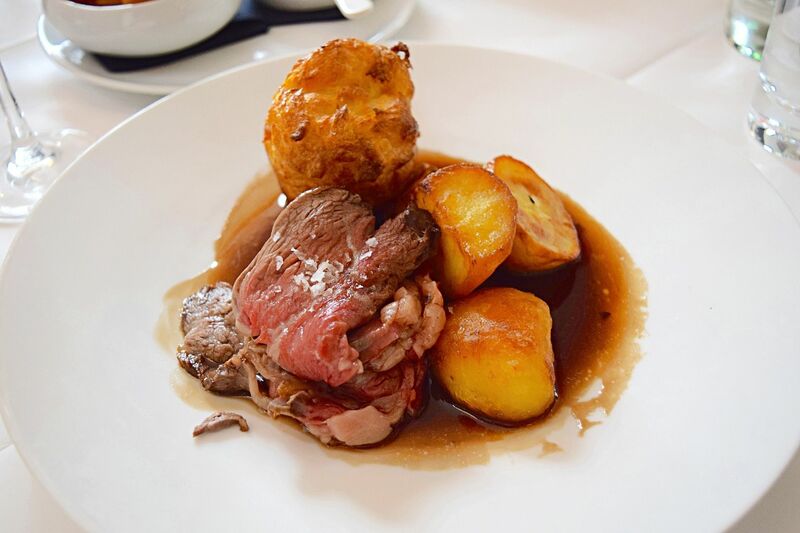 For Roast’s Sunday Roast they offer three courses from £37.50 per person and if someone you are going with is tempted by something other than a roast, there is usually at least two fish and vegetarian options. The beef and chicken roasts are some of the best meat I have eaten and you will not go hungry with the amount of trimmings you are given. You won’t be disappointed by the desserts either, expect to leave extremely satisfied and very full. Quaglino’s is a hidden gem on Bury Street, away from the typically hectic Piccadilly area. Enjoy a Sunday Roast in the comfort of their rather grand dining room and maybe with a little jazz music too from their resident singer. 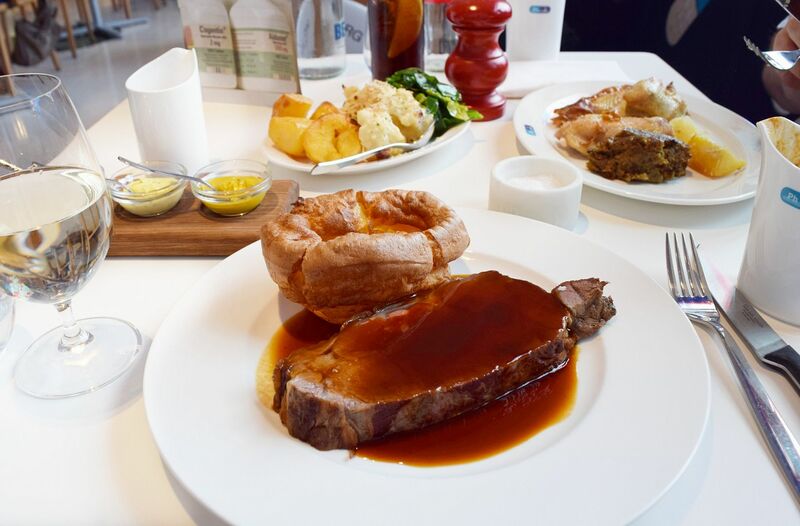 The roast beef is served blushing and they typically also have roast lamb or pork options on the menu, which come served with large Yorkshire puddings and an array of vegetables. Quaglino’s Sunday lunch offers two and three courses starting from £25 per head. You can also go for the bottomless Prosecco option for £20 per person. Gallery Mess is owned and connected to the Saatchi Gallery and as you might expect by something connected to the gallery it is a lovely space with great choice on their menu. For Sunday lunch, the roast beef option is a must. Offering a number of slices of medium roasted beef served with a sprinkle of salt and large crispy roast potatoes. The veg is roasted and finished in seasoned butter that you will really enjoy. As you might expect the restaurant can get busy so well worth booking quite some time in advance. Gallery Mess also offers bottomless Bloody Mary’s, Prosecco and champagne options for their weekend brunches. 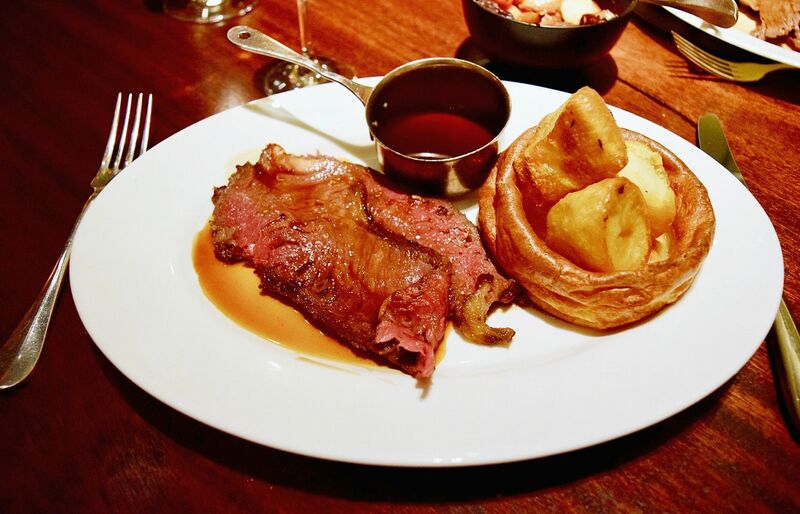 Check out more of our Sunday Roast in London reviews. I’ve lived in London for nearly 8 years, have researched the best Sunday Roasts like a zillion times over those past 8 years, and I have to admit (besides Roast) I have never been to one of these places (and some I haven’t even hard of!). Which is pretty amazing; it’s refreshing to see a list a bit different from all the rest. These look so amazing! I was just in London and wished I’d found this list sooner! 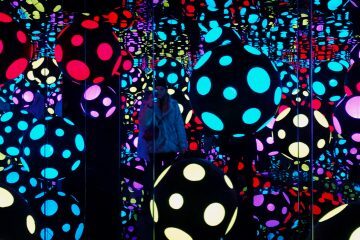 Must try these spots out next time around.